Red Sox rookie Henry Owens winds up in the second inning of his debut. He gave up three runs in five innings. 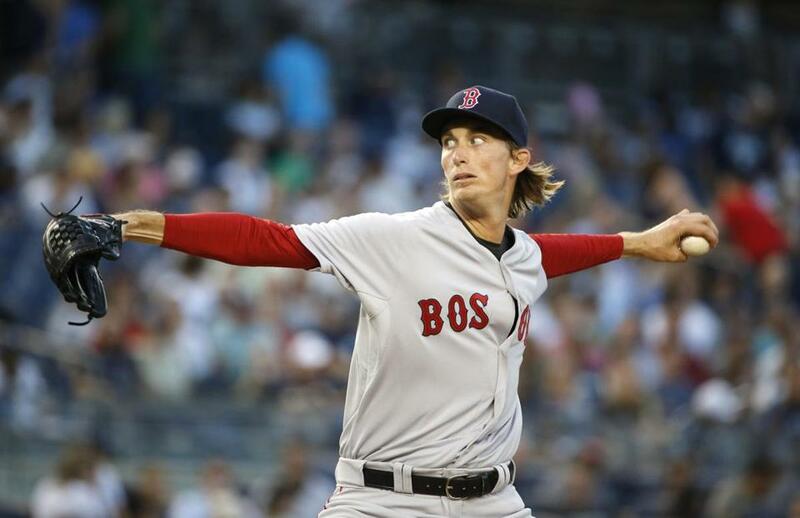 NEW YORK — Henry Owens walked off the mound in Yankee Stadium in the sixth inning Tuesday night. To that point, the 23-year-old lefthander had allowed one run and the Red Sox had the lead. For a pitcher making his major league debut against a first-place team in hostile environs, it was close to ideal. “I was pleased with the opportunity and tried to seize it as best I could,” Owens said. His positive first impression was obscured by what followed. A bullpen overloaded with bargains and castoffs fell apart, allowing 10 runs as the Yankees beat the Red Sox, 13-3. Brian McCann and Chris Young homered in a nine-run seventh inning as the first-place Yankees worked their rivals over with brutal efficiency. “They had their way with our bullpen,” manager John Farrell said. Robbie Ross Jr., Jean Machi, Craig Breslow, and Alexi Ogando were responsible for the carnage, allowing eight hits and four walks in three innings. The Sox have lost eight straight on the road and 13 of 18 overall. Owens took an undeserved loss. He allowed three runs on five hits over five-plus innings with a walk and five strikeouts. Not since the forgettable Robinson Checo in 1997 had a Red Sox pitcher made his debut in the Bronx. Owens hid any anxiousness under his ponytail and southern California cool. “I looked around when I warming up. Kind of, ‘Here I am.’ I tried to embrace it the best I could,” he said. Owens needed 34 pitches to get through the first inning but allowed only one run. He endeared himself to Sox fans by starting his career with a strikeout of Jacoby Ellsbury. Then Young singled, Alex Rodriguez drew a walk, and Mark Teixeira grounded a single up the middle to produce a run. That brought out pitching coach Carl Willis. Owens was one batter away from his debut getting out of control. Owens fell behind McCann but got him on a liner to center. Carlos Beltran then fouled out. Chase Headley singled to start the second inning for the Yankees. But Owens retired the next 12 batters, allowing only three balls out of the infield. After relying heavily on his fastball in the first, Owens mixed in his changeup, curveball, and slider to great effect. Owens worked fairly quickly — “I was giving them time to get in the box. I didn’t want to not make any friends today,” he said — and gave his family and friends plenty to cheer. His parents, sister, and some uncles were in the stands. “What was impressive was that he seemed to keep the emotion of the moment under control, made some quality pitches,” Farrell said. “He settles down and gives us five solid innings of work, gives us a chance.” The Sox gave Owens a lead against Masahiro Tanaka. Mike Napoli doubled to left field with one out in the fifth inning. Singles by Alejandro De Aza and Blake Swihart gave the Red Sox a run. Jackie Bradley Jr. followed with a sacrifice fly. Ahead, 2-1, Owens retired the side in order in the bottom of the fifth inning. But he did not get an out in the sixth. Young led off with a single and took third when Rodriguez thumped a double off the wall in center. Owens got ahead of Rodriguez, 0 and 2, but couldn’t get a fastball by him. A 2-and-2 changeup was down in the strike zone but Rodriguez stayed on it. “I just couldn’t finish him,” Owens said. With Owens at 96 pitches, Ross Jr. came into a high-leverage spot, one of his few such opportunities this season. Teixeira singled to drive in Young, McCann doubled to drive in Rodriguez, and Beltran had an RBI ground out. Owens was charged with two of the runs and the Yankees had a 4-2 lead. Pablo Sandoval homered in the seventh inning. Down, 4-3, the Sox were mugged in the bottom of the inning. Ellsbury reached on a throwing error by Xander Bogaerts. Machi, claimed off waivers from the Giants last week, walked Young before Rodriguez singled to center to drive in his 11th run in 10 games against the Sox this season. Breslow struck out Teixeira but McCann homered to right field ahead of doubles by Beltran and Headley. Brendan Ryan walked and Ellsbury drove in a run with a single. Ogando’s first pitch was a fastball up and over the plate that was lined into the stands in left field by Young. In his last 10 games, Ogando has allowed 10 runs on 12 hits — six home runs — over 11⅓ innings. “Every guy that we brought to the mound, some pitches found the middle of the plate,” Farrell said. In the last eight games, Sox relievers have allowed 24 earned runs on 40 hits over 31⅓ innings. Breslow, Machi, and Ogando are on one-year contacts and unlikely to return next season. The same is true of Justin Masterson. If the Red Sox want to change the look of the bullpen quickly, the logistics would not be complicated.